I have wanted to make this bun for quite a while and since I had already prepared the red bean paste it was a good opportunity for me to try it. 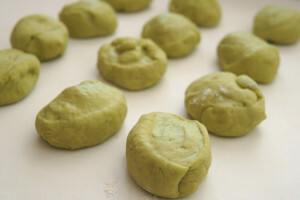 I also had a lot of green tea (matcha) powder, so I used it to make Green Tea Buns with red bean filling. This recipe was adapted from Christine’s Recipe. Set it aside to rise for 45 to 60 minutes or till double in size. Transfer dough to a clean floured surface. Deflate and divide the dough into 12 equal portions. Knead into ball shapes. Divide the red bean paste into 12 equal parts (about 35g each). Knead each part into small balls. Roll out each small dough ball with a rolling pin and flatten into a disc. Place a small red bean ball in the middle. Enclose and knead into a ball shape with the seal facing down. Repeat this step of rolling and wrapping fillings with the rest of your dough. 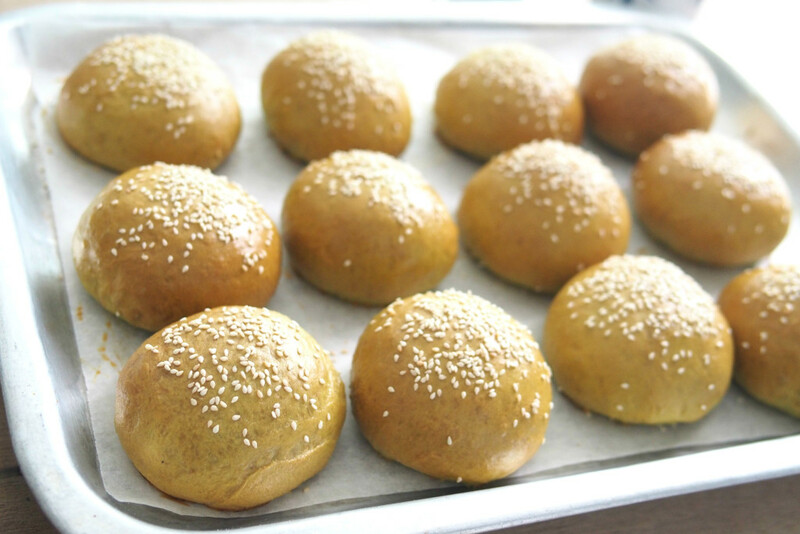 Place onto a baking tray lined with baking paper (2 inches apart from each bun), covered with cling wrap and a wet towel. Leave for the 2nd round of proofing, about 45 to 60 minutes, until double in size. 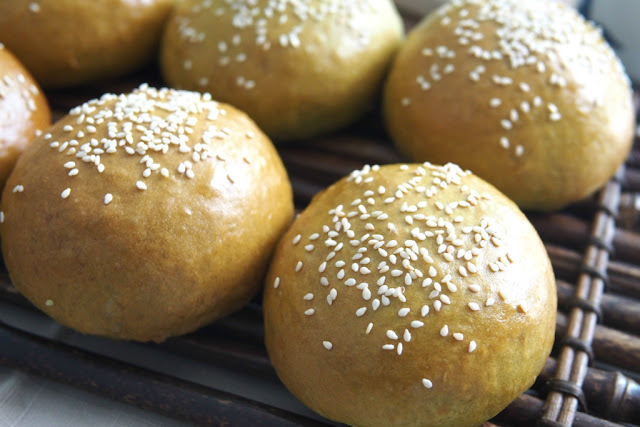 Brush the bun with egg wash and sprinkle with sesame seeds. This is optional. Bake in a pre-heated 170C oven for 15 to 20 minutes, or until brown. Transfer onto a wire rack and let cool completely. The original recipe from Christine’s Recipe suggested baking for 35 minutes at 160C. I found that this resulted in bun that may be over baked. You may have noticed that the red beans paste looks a little dry. This is because I reduced sugar and oil. Hi! Is this bread method (using tangzhong) softer than the japanese bread/bun recipe? I would really like to make either one, and want the softer one hahaha. I'm a beginner in bread making though, which one do you recommend me making? Thankyou so much! Thank you for dropping by. The Tangzhong method is softer. However, I would like to inform you that buns will usually turn out a bit dry if compare with loaf by using the same recipe. Please do not over bake your bun, otherwise the buns will dry.